This documentary introduces you to one of the few remaining matrilineal societies - the Mosou people, where women are in charge. The Mosou people, living in a hard to reach part of southwestern China, are one of the world's few remaining societies where women are in charge. Whereas traditionaly, men take the position in society's ruling order, and in modern times of equality, women are equal to men, it is almost historicaly and currently non-existant to find an "Amazonian" order of society where men plplay 2nd fiddle to the female ruling class. 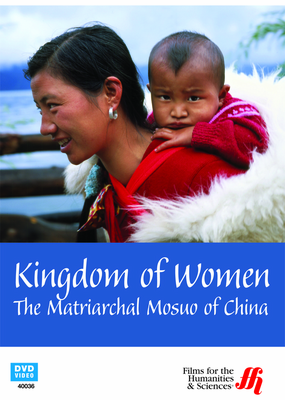 However, there are actualyly close to one hundred matriarchal societies remaining in the world, (a tiny number on a worldwide scale). The Mosou are just such a culture. Here, women rule naturaly, and no man is a husband. This documentary on their community shows how commerce, rituals, duties, festivals, and belief systems work in a place where women rule. Anthopologist Chou Wah-Shan presents this program along with Mosou villagers, giving us rare insight. Unfortunately, this way of life faces a threat from tourism and technology. This program offers a unique learning opportunity to look at a type of society very few of us are familiar with. It's a challenge to our assumptions. See yourself in this small village. Check it now while the Mosou are still around.